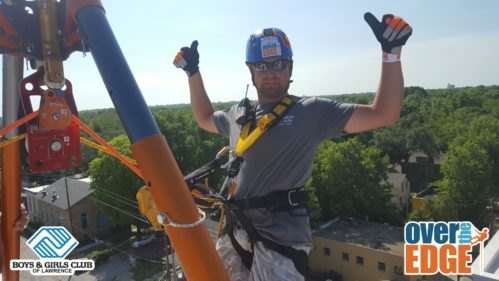 You’re looking at a picture of Mar Lan’s very own Jason Kellogg, rigged up and wholeheartedly and bravely ready to go OVER THE EDGE for the Boys & Girls Club on Saturday morning, August 25. Jason rappelled down the side of the 8-story building at 888 New Hampshire all in the name of raising donations for the Boys & Girls Club, the project he has been job superintendent for over the last 10 months (see Cover Page). Turns out he was one of the greatest fund-raisers as well, bringing in $2,395 which was well over his intended goal of $1,000. Way to go Jason!! When asked if he would consider rappelling again after this event, of course he said he would. No biggie for a daredevil like Jason.